FlashSystem 900 Model AE3 can be configured in capacity points as low as 14.4 TB to 180 TB usable and up to 360 TB effective capacity after RAID 5 protection and compression. You can couple this product with either 16 Gbps, 8 Gbps Fibre Channel, 16 Gbps NVMe over Fibre Channel, or 40 Gbps InfiniBand connectivity. 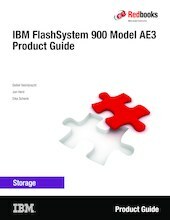 Thus, the IBM FlashSystem 900 Model AE3 provides extreme performance to existing and next generation infrastructure.